In my last article I discussed why our diets are based on so few plant species. Wheat, rice, potatoes and maize are the major carbohydrate sources for almost the entire planet. This makes it all the more exciting when a new player enters the game or at least gets due recognition. 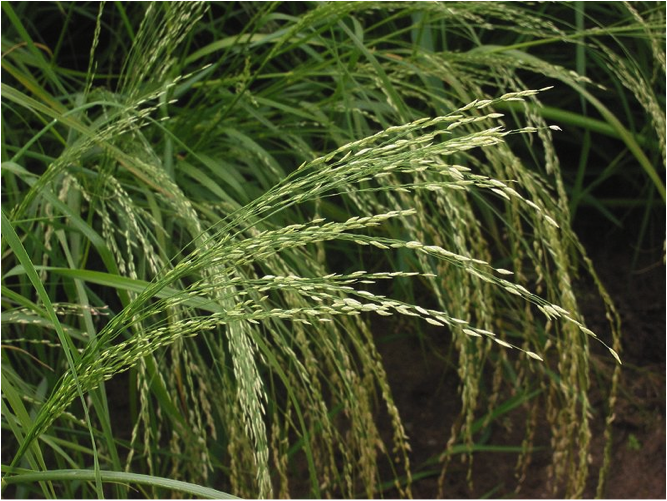 Eragrostis tef (commonly known as tef) is a grass that produces an extremely small seed (less than one millimetre in diameter). It is rich in iron and calcium and gluten-free which makes it suitable for people with celiac disease. It contains over 10% protein and is, unlike other cereals, rich in the essential amino acid lysine. Tef is not a new cereal crop, it has been grown in the Horn of Africa for at least 3000 years and still makes up a quarter of Ethiopia’s carbohydrate production where tef flour is used to bake the traditional injera flatbread. In modern tef farming, it serves as both an orphan crop in Ethiopia and Eritrea and as a fodder crop and gluten-free cereal in the “Western World”. Orphan crop is a term used for minor crops that are produced at much lower quantities than the big players and are not traded on international markets. However, they can be of great importance as part of the local culinary and agricultural tradition. They are also commonly well adapted to their specific habitats: Tef, for example, is resistant to many pests and pathogens as well as to drought and excess water. Sadly, orphan crops have been receiving almost no attention from crop improvement and breeding programmes. Advanced techniques like marker-assisted selection or the molecular tools to engineer these organisms genetically have simply not been developed/adapted for these plants. In Africa, orphan crops are especially common which means that our current efforts to improve food security partly miss exactly those who suffer most from hunger and poverty. Aiming to address this, a group of Swiss researchers have founded the Tef Improvement Project and recently published the genome of Eragrostis tef which will massively facilitate future breeding efforts. 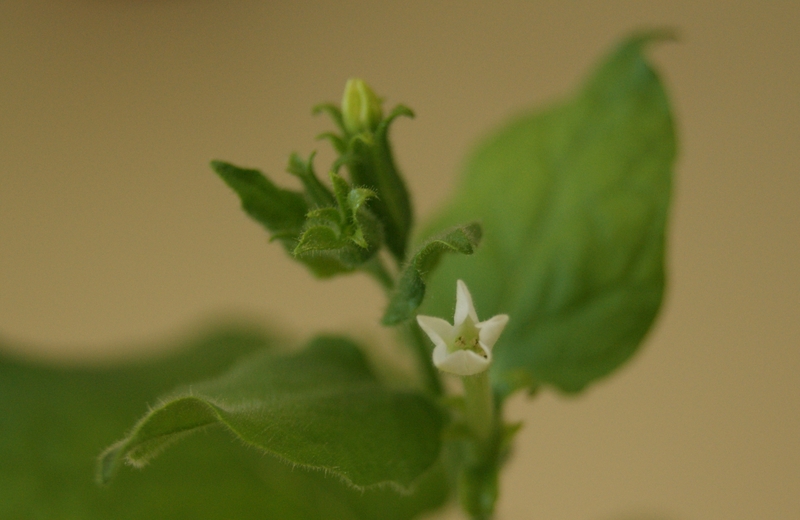 With help of the genomic sequence, many insights obtained from research on the model plant Arabidopsis and other major crop plants can probably be applied to tef. These “spill-overs” only require relatively small investments but have the potential to impact positively on the life of many millions. Tef’s exceptional nutritional profile also attracted the attention of western consumers, especially since David William’s bestseller Wheat Belly convinced many Americans that a gluten-free diet is healthier even for people not suffering from celiac disease (for which there is no convincing evidence at all). Since the 1980s, tef has been grown in Idaho, US by a group of farmers around Wayne Carlson who brought the idea of growing tef back from Ethiopia. Due to increasing demands, tef production is rising and the flour is traded internationally with the biggest trader being Prograin International bv based in the Netherlands. Tef is a fast growing C4-grass that can be harvested multiple times within one growing season. High yields and its high protein content make a great fodder for livestock (a luxury that most Ethiopians do not have) and it is now grown in many of the warmer parts of the US as hay and forage crop. Long ignored by international science and economics, tef couldn’t keep up with the intensively bred and fertilised major crop plants. Now that its importance for the people in its indigenous habitat and its potential for the “Western World” have been noticed, Ethiopian food security has a chance to improve in an effective and sustainable way and Eragrostis tef might turn out to be a valuable addition to our repertoire of crop plants. Interested and want to read more? Check out these papers about orphan crops and the TEF genome project. As we entrench ourselves firmly into the computational age, science is increasingly looking towards the general public for help with research. With the world just a click away, games and surveys have become common tools for engaging with the non-scientific community. Indeed, citizen science (as it is more formally known), has become a popular throughout all areas of science, including botany, and looks set to stay as a rewarding area for research in many disciplines. With this in mind, I interviewed Oliver Ellingham, a PhD student from the University of Reading, who has incorporated citizen science into his research of powdery mildew fungi. What is the research you’re doing? My PhD project at the University of Reading aims to develop molecular markers to aid in accurate and efficient identification of the approximate 800 powdery mildew species. When applying for funding, most research projects tend to include ‘avenues to impact’. However these are rarely followed through on. To achieve this small element in my project I have started the ‘Powdery Mildew Survey’: a citizen science scheme aiming to increase public knowledge and awareness in my research topic, but also biology, pathology, and horticulture in general. What is powdery mildew and why is research into it important? Powdery mildew is a fungal plant disease. It is termed ‘biotrophic’, meaning that is relies upon its plant host to live, survive, reproduce, and thrive. It will therefore not kill the plant, but greatly reduce its vigour, beauty, and fruit production.There are currently many research projects into varying aspects of this fungus, concerning disease spread and management (using both biological and chemical controls), as well as, like mine, ways to differentiate between the many species using varying parts of its DNA.This is important as being able to tell the difference between different species enables us to track them and know which are new to our island and which have always been here. In this way we can help to limit spread of pathogens between geographically separate areas. What is the economic impact of powdery mildew? Powdery mildew costs global agricultural industries millions of pounds per year in control and/or reduction in crop yields. As examples, up to 100% of a grape crop and 20% of a pepper or tomato crop can be lost if left untreated with fungicides. Less precise figures are available in the horticultural industry, however there have been interesting developments in grand-scale flower production. Roses produced en masse in the Netherlands are treated with fungicides to prevent distortion of the flower via powdery mildew infection. 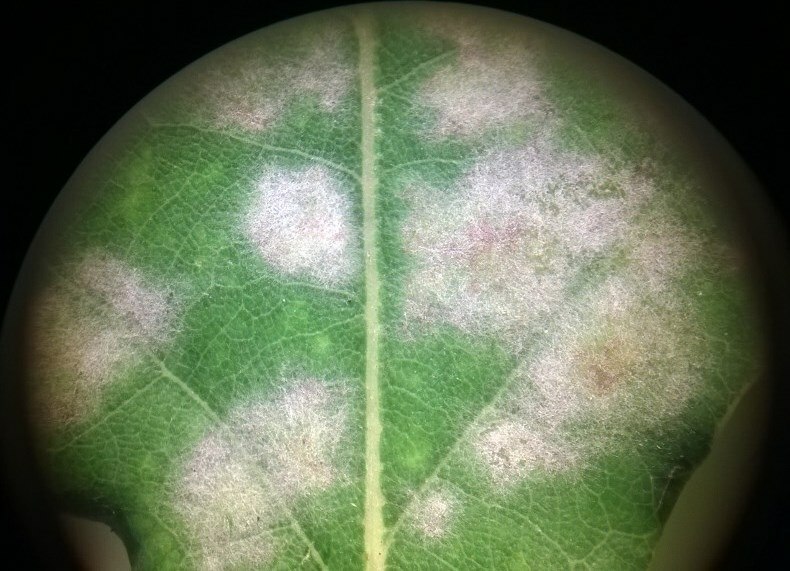 However in recent years, large-scale growers have turned to a new, significantly more expensive, biological control: the plants are treated with another fungus, called Pseudozyma flocculosa. This is antagonistic to the powdery mildew, and strangles it, but not the plant. What does the citizen science scheme entail? I offer an identification service. Members of the public can send me their powdery mildew infected plant material, and by identifying the host plant, analysing the fungus’ microscopic, morphological features, and finally extracting and amplifying its DNA I can identify the single species of powdery mildew present. As a by-product of this the sampling number for my project is greatly improved, as well as the distribution and diversity. What struggles have you had getting the public engaged in the scheme? The hardest thing in this first year of the project has been spreading awareness. I believe this to be significantly easier in the present-day, due to the internet and social media. However contacting like-minded, enthusiastic people, willing to spread the word is difficult when just sitting at my computer. Networking at flower shows and various conferences has helped this hugely, and I am very grateful to the people who have showed an interest and shared contacts with me. What do the initial results from you research show? Firstly, that powdery mildew is extremely common in the UK and that identification of its presence is possible by anyone. Also, that species identification is possible using microscopic, morphological analysis combined with molecular data. It has also shown that certain species are more common than others: those of the Erysipheae tribe, which have been shown to possess certain proteins to increase their ability to adapt and infect new hosts, are most abundant; while Phyllactineae are less common, potentially due to the adaptation of many of their features to warmer, Mediterranean climates. My third week began as the second had finished; with more RNA extractions (a task left over from the week before). I have to take samples from 24 different plants of different varieties, at different stages of maturity and have learnt the hard way that it’s a bad idea to tackle more than 4 at once, as the pipetting takes too long and the quality of RNA extracted starts to degrade. More excitingly, though with little success, I ran my first polymerase chain reaction (PCR) of the project. This is an important technique used throughout modern biology to amplify small quantities of DNA into quantities which are large enough to run tests with. However, you can’t just shove random fragments of DNA into the machine and hope that the right bits will be copied. 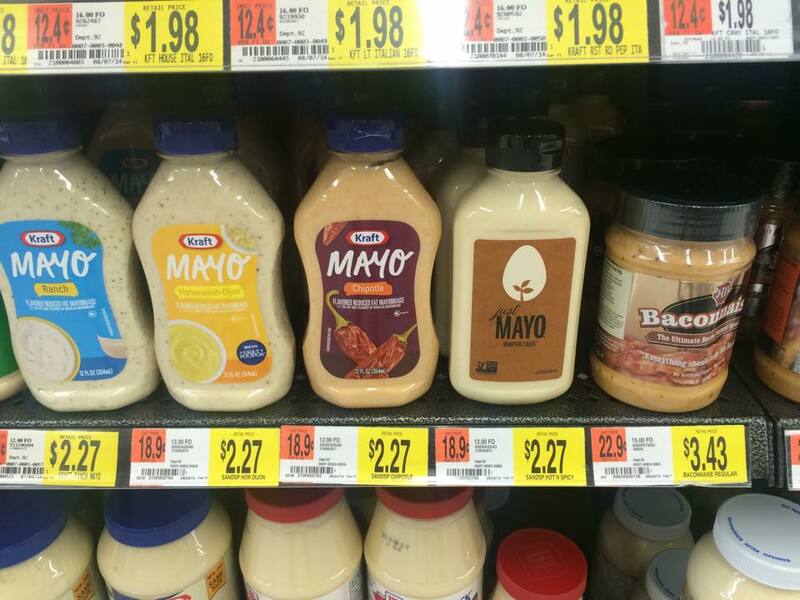 Instead, we need primers which specify the regions to be amplified by the enzymes. Primers are short fragments of nucleotides, about 20 bases (the general term for the 4 different letters of DNA – A,T,G and C) long and bind to specific sections of DNA which complement their sequence. Primers must be well-designed, to amplify only the DNA you are interested in; so some work better than others. Whilst they can bind to DNA that they don’t perfectly match (and still allow the enzymes to make more DNA), the worse the match is, the less likely binding is to happen. Additionally, if the sequence is too general, non-targeted sections of the genome might be amplified leading to a confusing result. PCR also often acts as a confirmation stage where we can check that things are working as expected – this is very useful when most of the time you are working with colourless and anonymous liquids! Before we designed our own primers, we trialed a set which targeted the rice version of the CKP gene to see if they matched up with the gene in wheat. These primers were already available to us and if successful, we wouldn’t need to go through the primer design process ourselves. Unfortunately, whilst some genetic material was amplified, sequencing showed us that the rice primers had amplified other random sections of the wheat genome instead of accurately copying the CKP gene as hoped. With no chance of other primers working, we spent a long morning working out which short sequences of bases would best amplify the CKP gene in wheat and have placed an order for their creation by Invitrogen – a specialist biotech company (other primer design companies are available…). Lots of nutrients and water. A little time, a lot of air. … you don’t have to be mad to work here but it helps! On a more plant friendly note, I spent a happy afternoon helping my supervisor repot her wheat plants. They needed more root space and had to be prepared for their move into the glasshouse around the corner which can better accommodate the plants as they grow taller. Sadly, we only managed to re-pot about 200 out of 1000 plants, so we still have a long way to go…. Sudbury, on first inspection, is a rather bland, spread-out mining town, inhabited by many, many trucks (most of them blue). When I first arrived, to help out on a project run by Andrew Tanentzap, I have to say I was a little underwhelmed. However the more you explore, the more remarkable the town becomes. It is one of the few areas of the world where remediation has really worked, and the next generation will inherit a greener and cleaner city than the one that their parents inherited. This remarkable change, from a barren ‘moonscape’ caused by years of acid rain (Sudbury was once the largest point source of sulphuric oxide fumes in the world, thanks to the extraction of large amounts of nickel from many mines in the area), to an area with burgeoning first generation forest cover, and recovering lakes, is a great success story that the area can be immensely proud of. With its industrial heritage, Sudbury, with its 330 lakes, makes an idea experimental location for a research group dealing in ecosystems and global change. Our test lake, Daisy Lake, is perfectly set up for studying the effects of terrestrial influences on aquatic ecosystems, as along its length the shores and wetlands have been remediated to various degrees. One section has been limed (spread with calcium carbonate, neutralising the otherwise very acidic soils) and so the growth is relatively lush, and the trees, although young, are not stunted. Other areas, closer to the smelter at the far end of the lake, are far more barren; bare, stained rock predominates, with a few stunted trees. In Daisy, we were studying eight stream deltas, each with very different personalities. At each site Andrew’s post-doc Erik and I collected algae samples (through a variety of fairly low tech contraptions, more of which later), sediment samples, water samples, and used the Floroprobe and BenthoTorch (two very expensive, high tech contraptions) to characterise the algal species found in the littoral zone (water near the edge of the lake) and benthic layer (the area at the top of the sediment) respectively. This all sounds very easy in theory, but in practice (as with any fieldwork, as I came to learn) things were far harder and more complicated… and often involved some rather novel solutions. If nothing else, this placement has certainly given me plenty of opportunities to stretch my problem solving skills! My first job was to build umpteen algae-collectors, which were incredibly scientific looking plastic tubes with cut up swim floats attached, from which 6 microscope-slides dangled from fluorescent string. These floated on the surface, but we also sank clay pot holders tied to bricks, as another surface for algae to grow on. We left these in the lake (on a beautiful sunny day) at each of the deltas and then returned to collect them 3 weeks later. After those three weeks had passed, We set out early, trying to avoid a storm that was due around lunchtime, only to find that between two boats we only had one working fuel cable. Great. So we towed each other around the lake, with our little motor struggling along at a snail’s pace. Whilst the clay pot holders had proven attractive to algae at most of the sites, trying to scrape the algae off the pot and into a rather narrow-necked falcon tube proved difficult. However, these still looked like our best bet, as the microscope-slide contraptions had only a thin layer of algae on each slide – we may actually have just built elaborate feeding platforms for the algae-eating zooplankton! The rain set in in earnest after we had got through just half the sites, and the wind got up – heavy rain whilst trying to scrape algae off clay plates tends to complicate things somewhat! Eventually though, we made it around all the sites, collected all the contraptions, and the rain stopped. Fieldwork is great fun, but the weather makes such a difference, especially when you are out on a very exposed lake! As well as working on Daisy with Erik, I also helped Andrew collect additional data for a project looking at the interplay between terrestrial and lake ecosystems. 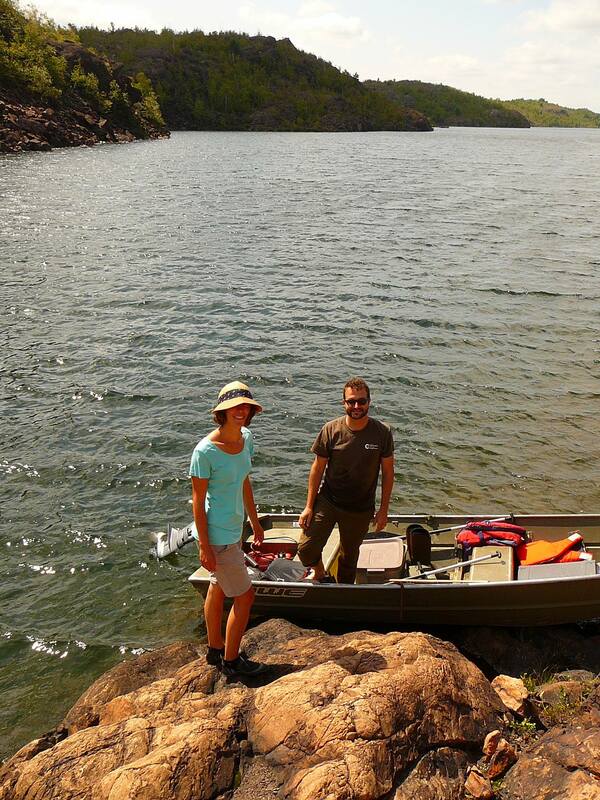 This meant going out to 6 other lakes around Sudbury, and six down in the Muskokas, to collect water samples, use the fluroprobe, and deploy and collect the microscope slide contraptions. 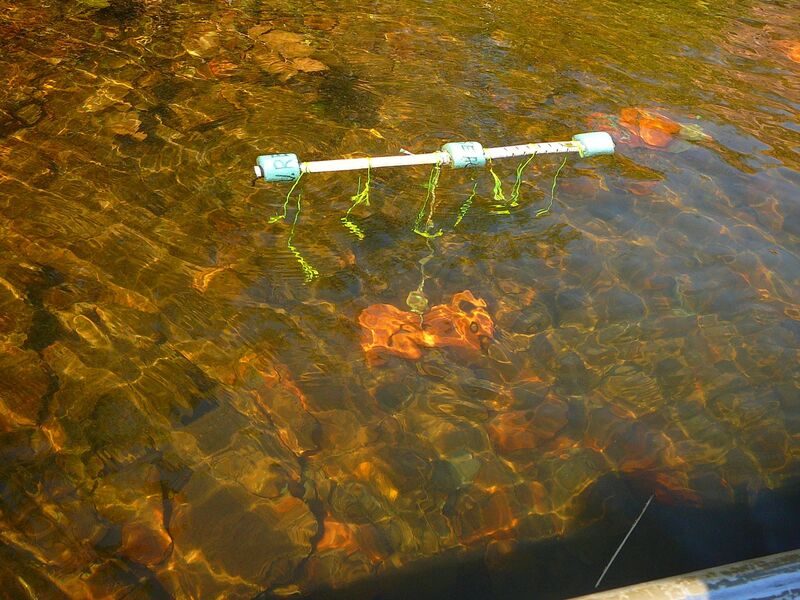 Key to the project was collecting clean leaf and algal samples, to go off for stable isotope analysis, to allow Andrew to calculate the influence of the terrestrial systems surrounding the lakes were having on the lake ecosystems. In order to grow clean algal samples without the influence of terrestrial DOM, we collected water from each of the lakes, then filtered it into jars and re-inoculated each jar with a small amount of unfiltered lake water, from which wehoped the algae would regrow. Again, simple in theory, but in practice involved hours and hours of standing by a vacuum pump, watching water drip, drip, drip through a filter. One night, on a field trip down to the Muskokas, we actually ended up filtering outside a Best Western hotel, so as not to set the fire alarms off! Safe to say we got many odd looks. However, the field trip down to the Muskokas was one of the best perks of the summer. We went down in September, almost at the peak of the colours changing, and had two lovely dry but crisp days. 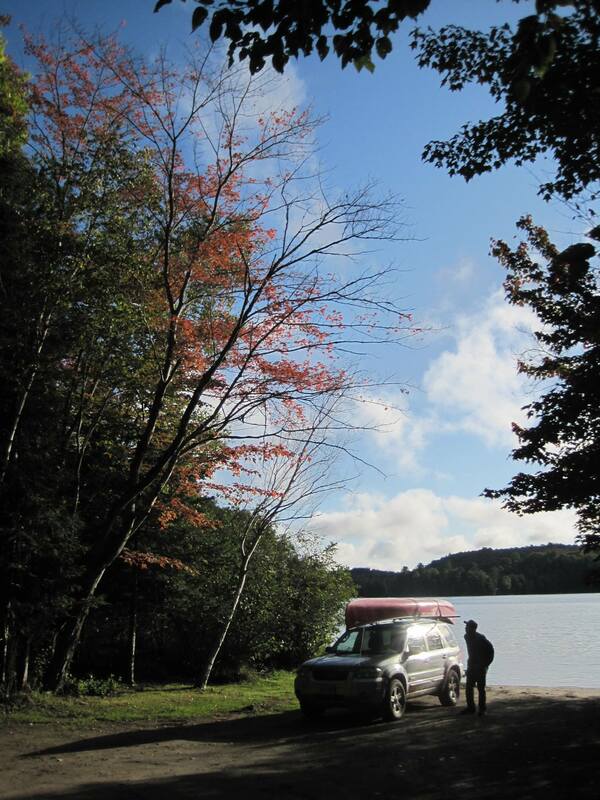 Driving down dirt tracks through beautiful forest, to find beautiful lakes to paddle out into was great fun, and a real adventure! It definitely offset the tedium of filtering. At the end of my seven weeks here I am very sad to be leaving. It was a great experience, with plenty of messing about on boats, and exploring new places. I have learnt a lot about the complications of fieldwork, how to solve problems on the fly with limited supplies, and just what really goes on behind those dry-sounding ‘Materials and Methods’. Since March this year, at least 5,800 people across the countries of Guinea, Liberia, Nigeria, Senegal and Sierra Leone have contracted Ebola. Of those infected, more than 2,800 have died. As well as being the largest outbreak on record, this particular incident is worrying because of its potential scale- in August, the WHO hoped to have it contained within 9 months (and with 20,000 infected) but recent research by American epidemiologists suggests that the process of containment could take up to 18 months, with 100,000s of people infected before the outbreak is brought under control. Ebola is the common name for Ebola Haemorrhagic Fever, caused by the similarly named ebolavirus. Spread through direct contact with bodily fluids such as blood or vomit, symptoms tend to manifest after a 1-2 week incubation period. Fever, muscle pain, vomiting and declining organ function are all symptoms, usually followed by significant internal and external bleeding. The disease has a startlingly high mortality rate; this varies from outbreak to outbreak, but is usually put at somewhere between 50 and 90%. Pressingly, there is currently no available specific treatment for the disease, with care usually limited to oral rehydration therapy and intravenous fluids. This lack of effective treatment coupled with the naturally high mortality rate means any outbreak has the potential to claim many lives, and is therefore a serious concern for both the countries involved and the wider international community. Recent efforts by the American government have seen an experimental vaccine fast tracked and delivered to 2 infected aid workers without the usual rounds of clinical trials. ZMapp contains neutralising humanised antibodies that recognise and bind specifically to ebolavirus particles, rendering them harmless. Given the potential scale and immediacy required of doses of vaccine, a problem is presented in terms of the means of production. Many thousands of doses are required, often at very short notice. In order to circumvent this potential issue, researchers have been investigating the potential for the use of plants as “bioreactors” to grow and produce these antibodies. The principle behind this approach involves the inoculation and subsequent infection of a particular strain of tobacco, Nicotiana benthamiana (a close relative of the cigarette supplying cousin Nicotiana tabaccum) with a virus from the group of plant viruses called the Geminiviridae. These have single stranded circular DNA genomes, and although responsible for significant crop losses worldwide, here they have been co-opted for human benefit. Their genomes are exceedingly pliable, and extra sections of DNA can be inserted in without compromising infectivity. In this case, DNA sections encoding the humanised antibodies making up the ZMapp treatment were inserted, and the subsequent genome produced then transfected into the plant. Once inside the plant, the existing viral features of the genome ensure replication and propagation of the entire vector, including the antibody, leading to production of high levels of antibody. These antibodies can then be purified and extracted from the plant, and refined in order to provide doses of the vaccine. The advantages of production and accumulation of antibodies from plant-based bioreactors are numerous. Firstly, the particular viruses in question, the Geminiviridae, are able to replicate extensively within the plant, resulting in high yields. In addition, costs of production are lower as the maintenance of growing conditions is relatively inexpensive. Finally, generating the Ebola antibodies in plants minimises the risk of cross contamination with other mammalian viruses. All in all then, could this be a timely and effective source of the treatment for this deadly disease? ZMapp has been fast-tracked in this instance, but must first still pass a battery of clinical trials to ensure its efficacy and safety, and questions still remain over the accessibility of it as a healthcare option for the poorest worldwide, for whom it is perhaps most urgently needed. Perhaps more solidly impressive is the global attention gained for the use of plants as bioreactors, and for their ability no act as relatively inexpensive and high yielding sources of various pharmaceutical goods. This makes them potentially able to lower the current cost of production to levels that would make these pharmaceutical products more universally affordable. Ever wonder why some trees turn stunning shades of red and yellow this time of year while others stay a bright green year round? It’s all about three important things plants need to survive: warmth, light and water. Evergreens, which are mainly conifers, tend to live in regions that get very cold in the winter and have quite short summers as in the Boreal forests that ring the Arctic Circle. They experience shortages of all three necessary ingredients in the Arctic winter, no sun for months means temperatures of as low as 80 degrees Celsius below zero and any available water being locked away, unreachable to plants, in the form of ice. Deciduous trees, on the other hand, lead a much more comfy life. They still have chilly winters but temperatures tend to hover around or dip slightly below the zero mark. They also get lovely, long, warm summers with plenty of time to grow and barrels of rainwater to spare. This allows them to store up enough energy during the growing season so they can afford to drop their leaves when it gets cold and have enough energy to regrow the following spring. But why bother dropping their leaves and re-growing them? The answer is in the third element in our list: water. Leaves have very large surface areas so represent a lot of potential area to lose water from. When it’s winter and all the ground water is frozen, losing any water through the leaves can be very damaging to the tree that need to hang to on as much liquid as possible. 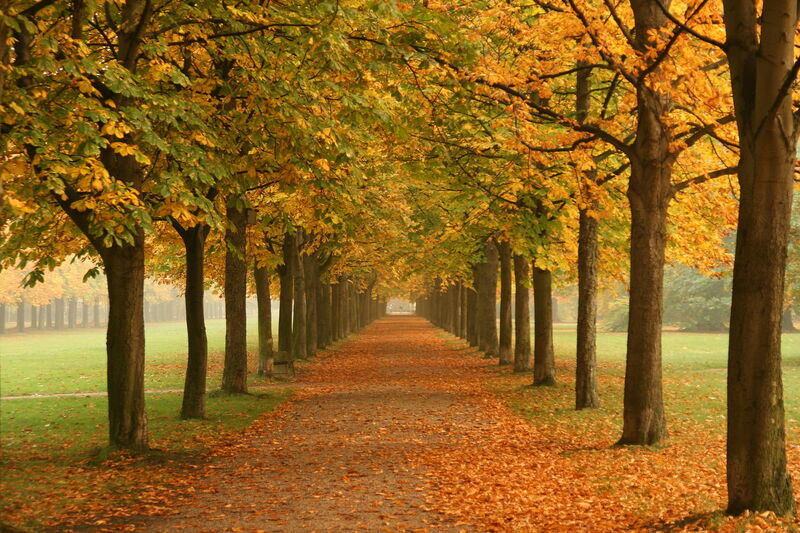 By dropping their leaves and thus reducing their surface area, deciduous trees are able to avoid a large amount of water loss. Of course they don’t just fall off, the trees recover as much nutrients as possible from their leaves before dropping them; it is this relocation of the green, nutrient rich chlorophyll in particular that is seen since this exposes the vivid reds and yellows of the anthocyanin and carotenoid pigments that are always present in the leaves but usually masked by the much more abundant green chlorophyll. Going back to evergreens though, they still have the problem of water loss since they don’t drop their leaves in the winter. They have developed another solution to reduce water loss which is a typical characteristic of conifers; they have reduced their leaves to needles. This again reduces their surface area to minimize water loss while not incurring the huge cost of dropping then re-growing their leaves. Dropping them entirely is not feasibly because the low temperatures slows the actions of the microbial community to practically nothing with the result that nutrient cycling is very slow so the soil is poor quality, thus the trees don’t have the resources to regrow their needles every year. What you might not know is that cold places are not the only place where evergreens are found. Non-conifer evergreens exist around the equator due to a lack of seasonal change. With good growing conditions all year round there is no need to drop their leaves or reduce them to needles so we find broad-leaf evergreen trees in equatorial regions. Another side effect of the lack of seasons is that the trees don’t lay down the characteristic annual rings in their trunks but have a more or less consistent grain throughout. So there you have it! Trees that change color do so not to delight us and give us material to make leaf piles with, but because it makes evolutionary sense for them to do so. It allows them to conserve nutrients while avoiding the worst of the winter drought caused by plummeting temperatures and wait for the sun to come back. That certainly doesn’t mean we can’t enjoy the brilliant colors this produces as we always do!